Ana Matronic really really really likes robots. Perhaps her name should have been something of a clue. She is perhaps best known as the female lead singer of the Scissor Sisters. 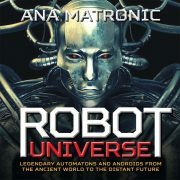 Matronic is also the author of 2015’s Robot Universe: Legendary Automatons and Androids from the Ancient World to the Distant Future. Which is (I am sure this will astound you) a book about robots. This 225 page hardcover is a coffee table book, a glossy paged, heavily illustrated guide to the hundred most epic robots and automatons of fiction and history.